MEDITATIONS ON THE PASSION: How Caiphas Adjured Jesus To tell Him If He Were Christ. How Caiphas adjured Jesus to tell him if he were Christ. Again the high Priest asked Jesus, and said to him, I adjure thee by the living God, that thou tell us if thou be Christ the Son of God. Jesus saith to him, thou hast said, I am but I say to you, hereafter you shall see the Son of man sitting on the right hand of the power of God, and coming on the clouds of Heaven: then the high Priest rent his garments saying, he hath blasphemed, what need we witnesses any further? behold now you have heard the blasphemy, how think you? who all condemned him to be guilty of death. 1. Blind the heart of this people, and thicken their hearing and shut their eyes, that with their eyes they see not, with their ears they herd not, and with their heart they understand not, and be converted. 2. Let us oppress the just, because he is unprofitable to us and contrary to our works, he argueth us of sins agains the law, and he nameth himself the son of God. 3. Thy cause was judge, as if thou wert an impious man. 1. Consider how the humble Jesus stood in the midst of that malignant council bound and accused in manner of a malefactor, without defending himself, or having any to defend him, on the other side his enemies compassing him about, in manner of raving dogs opened their mouths against him, and not finding where to take hold on him since that he gave them no answer: they consumed themselves with grief: for which cause the proud high Priest not being able to hide his rage any longer rose up with fury and adjured him in the name of God to tell them plainlyif he were the son of God. 2. Consider how there was never in the world any question either greater or more noble then this: first for respect of them that made it, which was the Council of the Jews than the which there was not any thing of greater authority & religion upon the earth if malice had not blinded their eyes. Secondly in regard of the party demanded, which was God himself being made man. Thirdly in respect of the matter whereof he was demanded, which was his Godhead. The beholders hereof were all Angels & men together: for that upon the answer of Christ depended the chief good of the one, and the chief joy of the other. If Christ which loved more our good then his proper life not only in most plain words confessed the truth, but to take away all manner of doubt which might be made thereof affirmed likewise than albeit they saw him now in such manner disposed, as the Prophet had foretold of him: nevertheless the time should come when as they should see him fit as Judge on the right hand of the LMajesty of God, & come in glory upon the clouds of Heaven. 3. Hence we may gather the greatness of the band wherein we stand obliged unto our Savior, for that he knowing that if he had held his peace, as he might have done, not being subject to man, his enemies could never have been able, not having any testimony against him, neither finding in him,any cause of death, to have condemned him: and moreover he knowing that for this confession he was to receive at their hands infinite injuries & torments, and finally death itself nevertheless; setting before himself, as the Apostle saith, the joy which his most loving heart was to enjoy by the saving of so many souls, in respect thereof making little account of his own life & despising all confusion he submitted himself to the ignominy of the cross. O confession most worthy, and full of unmeasurable charity: O confession from the which resulted to God such glory, to the Angels joy and restanration, and unto man so singular a remedy. 4. 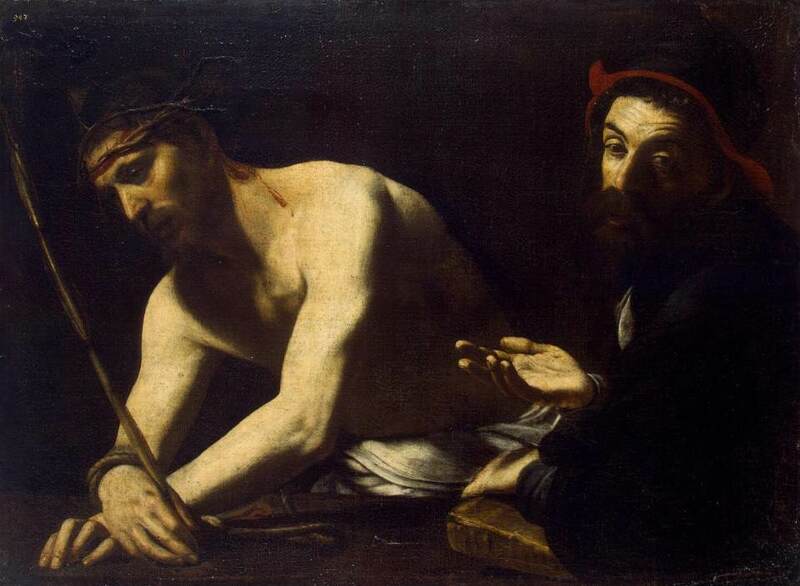 Caiphas having heard that divine confession of Christ, being unworthily to hear so high an answer, and blinded with the brightness of so clear a light, began in raging sort to rent his garments, and to condemn the Son of God for a blasphemer. O unhappy high Priest: Christ could not, being truth itself, say other then truth, but these thy words truly are blasphemy since that thou attributest that unto God, which is not of God, and thinkest that the Son of God is a pure creature. Take compassion now O my soul thy Redeemer, who would vouchsafe to humble himself so much for that he being that brightness of eternal light, that glass without spot where on could fall no sin, and he whom the Angels in Heaven continually praise saying, Sanctus, Sanctus, Sanctus, suffered himself of sinners ere on earth to be condemned for a blasphemer: and He that not by rapine but by his proper nature, was always equal with his Father, permitted himself to be adjured worthy of death as a usurper of the Godhead. Thou shalt pray unto Christ our Lord, since that he being the eternal truth, would for thy leavings and false works be accused of blasphemy, and suffer with so great patience that propane voice of the Jews which judged him worthily of death: that he will give thee grace to suffer willingly for truth and for his love all kind of evil which shall be said against thee, & to be judged a blasphemer and worthy of a thousand deaths as thy sins truly deserve, that being displeasing unto the world, thou maist be more acceptable in the sight of his Majesty. 1. Christ being proved with injuries & false testimonies holdeth his peace, but being adjured to speak the truth to the honor of God, answereth, although he knew that therefore he should suffer much: to teach us that whensoever the honor of God requireth we must not for any kind of peril yea although we should loose our life, omit to speak the truth. 2. We must not be over ready to judge or interpret our neighbors words or actions rather in ill part then in good neither must we easy believe the evil speeches which are told us others, least we err as Caiphas did. 3. We must never make any resolution, neither determine with ourselves about any thing when as we possessed with any temptation: for that the passions of our mind do oftentimes not only make that seem great which is little, but also that that is true, which in deed is false: as it happened to Caiphas. 4. It is the property of the world to condemn those that speak the truth, and to praise such as make account of it therefore if thy right and true speech shall be at anytime judged blasphemy, trouble not therefore thyself, neither for all this do thou spare to speak the truth, since that Christ also hath suffered the like. 5. We ought not to fear the judgements of men, because they can not thereby make us evil if we be not already, but let us fear to be found guilty in the judgment of God, who will judge us, not, as we have been before the eyes of man, but as we are found to be in his sight. 6. That others detract us or speak evil of us, can by no means hurts us, but rather may profit us much if we will , for that hereby we may be made much better by being made more humble.